This was done plain old WalMart Mainstays brand acrylic. 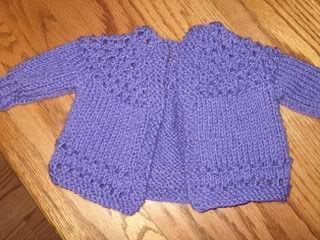 It isn’t my raving favorite yarn to work in, but when it comes to projects for which I want a nice, soft yarn that is nearly indestructible – such as for baby clothes which are going to end up tossed in the washer and dryer – it’s great. It also makes nice afghans and blankies. Anything for which you are prizing softness and machine-cleaning ability, it’s your deal. Especially when knitting with honkin’ big needles like the 10-1/2 jobs I just used, DANG. This is a very soft and cuddly kind of sweater. I’ve heard that this yarn is discontinued, but it turns up semi-regularly at my WalMart. Of course, my WalMart has an “after-thought” of a craft section. They have what they have, never the same things twice in a row, and if you try to get any information from the staff there, they will gaze upon you in puzzlement (“Why is this woman talking to me? I’m wearing my invisibility cloak!”) and then, after a great deal of thought and perhaps a few calls to somebody “in the back”, they will inform you that they really don’t know anything about it and you should come back on Tuesday between 10:15 and 10:25, which is when the Only Person At The Store who knows about the ordering policies of the craft department is ‘on’. I actually had a secret Wal-Mart yarn fetish for years...I'm in recovery now (having donated all my stuff to my students to make blankies for Project Linus) but I feel you...there's no shame in super-soft acryllic...really. LOL, my first knitting was all done with Wal-Mart yarn, and yea verily I have suffered no lasting ill effects. (Well, at least not that I'm admitting to...) Sounds like just the thing for a tough but cuddly baby sweater. I like the color, too.